"sufferth an aylehouse to be kepte in the vicar[age]", he was not impressed and decreed "that he shall hereafter suffer no ayle to be solde in the vicarage sub pena iuris [under penalty of law]". The current establishment is called the Victoria Inn, but it is known that an earlier pub called The Sun served the village and is recorded in Baines's 1822 trade directory, with Marmaduke Redmayne serving as the landlord. 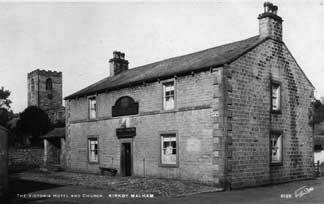 The earliest reference to an inn in Kirkby Malham is in the parish records, which show Jennet the wife of William Atkinson of Kirkby, Innkeeper who was buried 27 Feb 1696. The Alehouse Calendar of Recognizance shows two licences granted for the township in the 18th and early 19th centuries, although the names and locations of the premises are unknown. At least once in the village's history there has been more than one inn and you can see in the list of licensees that Richard Hardacre and John Hall were both innholders in Kirkby Malham during the same period at the turn of the 18th century. 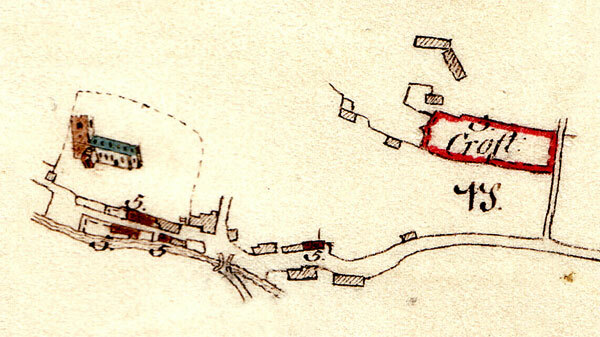 These earlier inns may not have been on the same site as the present pub, although the 18th and early 19th century establishment was out of use and replaced by The Victoria before photography arrived, the 1766 Serjeantson estate map shows a Mrs Williams' farm, with brew house, and presumably also the inn, as the group of buildings that used to stand on the south side of the churchyard. This included three houses standing on the north side of the lane in what is now the churchyard. An 1801 painting of the village by Thomas Girtin, shows a building on the present pub site. It is unclear in the painting whether this is a an inn or not, but it was probably a private dwelling at the time, as the Rev John Robinson was living in a house called "Kirkby Bridge End" around 1802, which would seem to fit in with the painting. According to the Serjeantson estate book, about 1802 John Hall rented what had been Mrs Williams' farm, and in addition to the 3s 9d rent for his homestead, he paid an additional £10 rent for the house also being used as an inn. The land associated with his farm is later associated with the pub that GJ Serjeantson redeveloped in 1840, which stands today. "I am told that there used to be an inn near the church with the delightful sign The Angel & Trumpet." It had been suggested by the Rev TC Henley in the Parish Notes, that one of the cottages which used to stand on the South side of the churchyard was also once an inn, which ties in with information from the Serjeantson Estate book. He also states that Kirkgill House was a droving inn, but this latter suggestion hasn't been further substantiated by written evidence. A Piece in Thos Wetherheads Field near do. The plan in the Estate Book indicating the buildings lying within the village shows that she had middle one of the three houses along the south side of the churchyard, with the stable and brewhouse (later used as a bakehouse) on the other side of the road next to the beck. Her alehouse may have been called the Angel and Trumpet, The Sun or something else entirely, but the building on the corner, seen in the Girtin painting and demolished about 60 years later to be re-developed as The Victoria, wasn't an inn at the time. In a later entry in the Serjeantson Field Book, about the time of the Girtin painting, it appears to be described as Bridge End and occupied by the vicar, Rev. John Robinson. Mrs Williams' farm buildings in Green Gate [Church Lane] in red and numbered 5. The carved lintel above the door of The Victoria Hotel boasts that the present building was erected by George John Serjeantson in 1840. 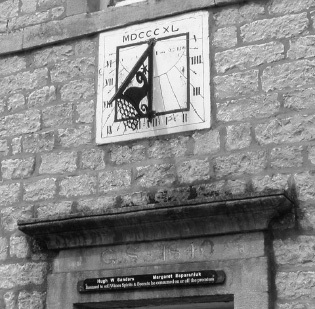 The fact is doubly commemorated by the carved lettering GS 1840 and the fine sundial bearing the same date in Roman numerals. He was probably putting his mark on the family estates which he had only just inherited on the death of his father, William Rookes Leedes Serjeantson. George Serjeantson's sun dial over the front door. Ever since I have imbrased every applicable opportunity possible for a complition, and yet after all defeated! if I could possess you (but I have treated you so) we will let alone fixing a time, the model will take two or three days yet to finish it, you need not be afraid of any preposterous executions (because it might fright Her Majesties Horses as her Royal Highness and her consort Prince will ride over every day)1 though I could like somewhat handsome with regard to its perspicuous situation, and a little towards a melioration of my conduct towards you. 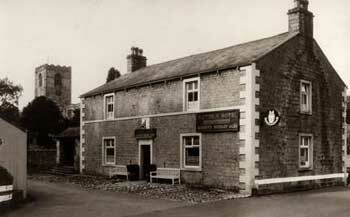 The dial was brought at last and fixed up on the village inn, where it is still. But no one wants a sun-dial, or anything of the sort hereabouts, now, remarked the squire, when he had finished telling the story, for they all take their time from the buzzer. The construction of the building is rather strange, the front or South elevation is of coursed limestone, the East and West elevations and quoins are of coursed ashlar, dressed sandstone and the rear is random rubble. The west gable overlooking the churchyard is also anything but flat and vertical. However when he inherited the estate on the death of his father in 1840 the estate was heavily mortgaged, so money was probably tight for estate improvements. The Victoria also lacks one feature which is particularly useful in a public house, a proper underground cellar, which must have made the beer somewhat variable in the days before refrigerated cellar coolers were installed. There wasn't originally a window above the front door, this was added some time after 1927, the area previously having been a linen cupboard at the end of a corridor running front to back like the downstairs corridor. Although still very traditional in layout, the Victoria has been remodeled several times in its lifetime, although it hasn't suffered the excesses perpetrated on some country pubs. Named The Victoria Hotel probably because it was built in the year of the Queen's marriage to her beloved Prince Albert, it was actually recorded on the 1852 OS map as the Prince Albert, and on the 1871 census as the the Albert & Victoria Inn. Again no evidence has come to light from old advertising, directories or the like to support either of these alternative names, but as mentioned before, it had a painted sign of Victoria and Albert on horseback at some time between 1840 and 1866. It was certainly the Victoria Hotel by 1886 when the advertisement seen below appeared. In the 1990s it was decided that the "Hotel" part wasn't appropriate and it started to be advertised as the Victoria Inn, although to the locals it has always been The Vic! George Serjeantson died in 1866 and as he had no children of his own, left the both the Hanlith estate and his Camphill estate at Bedale in trust to Elizabeth, the wife of his cousin James Jordan Serjeantson. On her death or re-marriage the estates were to pass to her eldest son Cecil Miles Serjeantson. 1886 Advertisement for the Victoria and "Spa Well"
Sketch by Gordon Sanderson in 1909. Elizabeth Serjeantson died in 1919 and the pub and outbuildings were sold to William Bairstow, a Leeds fishmonger and Tom Smith, the licensee at the time, for £1,150. It quickly passed on to a new owner, a retired Grimsby grocer called Reginald Barker Coulthirst, for £2,000 in 1920. In 1926 the Victoria was sold to Albert Pilkington of The Adelphi Hotel, Burnley for £ 1,200, with no mention of the Hanlith Lane barn and low garden. Fred Magnall, a dairyman from Poulton-le-Fylde, purchased the Pub in 1927, paying £ 2,200, part of which was a loan of £ 1,500 from Masseys Burnley Brewery. Fred Magnall had contracted TB and left farming and having inherited £1000, a considerable amount in those days, had bought the Victoria. However the business was not really good enough to support the extra debt he took on and sadly his wife hung herself in the washhouse and he then drank himself into an early grave two years later. When Fred Magnall became ill in 1928 his sister, Mary Maud Broughton, came with her family to look after him. Fred died intestate in 1929 and Mary Maud Broughton and Emily Elizabeth Taylor were granted a letter of administration for his estate. He had left an outstanding debt of £ 1,628 to Masseys and in 1930 the two women transferred the pub to the brewery in full settlement of the outstanding debts. They didn't leave the pub however, Mary's husband Sandy, who had been cycling over from Burnley to spend weekends with his family, took over the tenancy and together they ran the pub until 1950. Sandy Broughton died tragically in 1951 and Maud continued to run the pub for a further three years after his death, retiring to Airton. Charles Edward & Matilda Wolfenden 1906 -10 Parish Meeting archives. Thomas Howson 1910 -13 Parish Meeting archives. Tom Smith 1920 Sold by the Serjeantson estate 1920. Property deeds. Reginald Barker Coulthirst 1920 Property deeds. Albert Pilkington 1926 Property deeds. Fred Magnall 1927 - 29 Property deeds. Joseph Ernest Johnson 1954 - 57 Parish Meeting archives. Cyril Longthorn Stewart 1957 - 60 Parish Meeting archives. Michael & Enid Taylor 1960 - 64 Parish Meeting archives. Jeoffrey Sharp 1964 - 66 Parish Meeting archives.